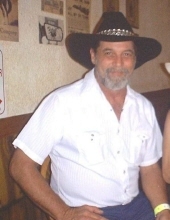 Edsel (Wayne) Steelman, 65, of Love Valley, N.C. completed his earthly journey surrounded by family and friends Tuesday January 29, 2019. Wayne was born October 9, 1953 in Forsyth County to the Late Edsel Maurice Steelman, and Lois Carter Steelman. Surviving are his wife Linda Steelman; his Mother, Lois Carter Steelman of Yadkinville NC; Children, Anthony Dwayne Steelman of Colorado, Ivy Nicole Steelman of Yadkinville NC, Step-son Christopher Smith of Liberty N.C.; Grandchildren Shylinn Ann Lakay Hunt and Jonah Wyatt Steelman of Colorado; Sister, Teresa (Danny) Phibbs of Yadkinville; Nephews, Austin Trey Spillman and Samuel Lawson Phibbs. He was retired from the North Carolina Department of Natural and Cultural Resources. He enjoyed working at Pilot Mountain State Park, Horne Creek Living Historical Farm in Pinnacle, N.C. and Fort Dobb, Statesville, N.C. Wayne grew up attending Courtney Baptist Church with his family and served as a member of the Courtney Volunteer Fire Department in late 1970’s – 1980’s. He loved his family, being outdoors, horse back riding , history, westerns and laughter. His friends knew him to have a great sense of humor and making others smile. A celebration of life will be held at The Silver Spur in Love Valley. The date will be announced at a later time. To send flowers or a remembrance gift to the family of Edsel Wayne Steelman, please visit our Tribute Store. "Email Address" would like to share the life celebration of Edsel Wayne Steelman. Click on the "link" to go to share a favorite memory or leave a condolence message for the family.